Encyclopedia - TerritorioScuola Enhanced Wiki Alfa - Enhanced Search with WikiPedia Using Robots to display related resources from the web to all WikiPedia words (Video/Audio, .doc, ,pdf, .ppt, maps, edu, .html). This article is about the type of reference work. For other uses, see Encyclopedia (disambiguation). An encyclopedia or encyclopædia is a reference work or compendium providing summaries of knowledge from either all branches or from a particular field or discipline. Encyclopedias are divided into articles or entries that are often arranged alphabetically by article name and sometimes by thematic categories. Encyclopedia entries are longer and more detailed than those in most dictionaries. Generally speaking, unlike dictionary entries—which focus on linguistic information about words, such as their etymology, meaning, pronunciation, use, and grammatical forms—encyclopedia articles focus on factual information concerning the subject named in the article's title. Encyclopedias have existed for around 2,000 years and have evolved considerably during that time as regards language (written in a major international or a vernacular language), size (few or many volumes), intent (presentation of a global or a limited range of knowledge), cultural perceptions (authoritative, ideological, didactic, utilitarian), authorship (qualifications, style), readership (education level, background, interests, capabilities), and the technologies available for their production and distribution (hand-written manuscripts, small or large print runs, internet production). As a valued source of reliable information compiled by experts, printed versions found a prominent place in libraries, schools and other educational institutions. Indeed, the purpose of an encyclopedia is to collect knowledge disseminated around the globe; to set forth its general system to the men with whom we live, and transmit it to those who will come after us, so that the work of preceding centuries will not become useless to the centuries to come; and so that our offspring, becoming better instructed, will at the same time become more virtuous and happy, and that we should not die without having rendered a service to the human race in the future years to come. The word encyclopedia comes from the Koine Greek ἐγκύκλιος παιδεία, transliterated enkyklios paideia, meaning "general education" from enkyklios (ἐγκύκλιος), meaning "circular, recurrent, required regularly, general" and paideia (παιδεία), meaning "education, rearing of a child"; together, the phrase literally translates as "complete instruction" or "complete knowledge". However, the two separate words were reduced to a single word due to a scribal error by copyists of a Latin manuscript edition of Quintillian in 1470. The copyists took this phrase to be a single Greek word, enkyklopaidia, with the same meaning, and this spurious Greek word became the New Latin word "encyclopaedia", which in turn came into English. Because of this compounded word, fifteenth century readers and since have often, and incorrectly, thought that the Roman authors Quintillian and Pliny described an ancient genre. 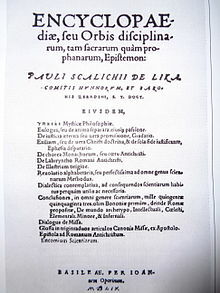 Title page of Skalich's Encyclopaedia, seu orbis disciplinarum, tam sacrarum quam prophanarum, epistemon from 1559, first clear use of the word encyclopaedia in the title. In the sixteenth century there was a level of ambiguity as to how to use this new word. As several titles illustrate, there was not a settled notion about its spelling nor its status as a noun. For example: Jacobus Philomusus's Margarita philosophica encyclopaediam exhibens (1508); Johannes Aventinus's Encyclopedia orbisque doctrinarum, hoc est omnium artium, scientiarum, ipsius philosophiae index ac divisio; Joachimus Fortius Ringelbergius's Lucubrationes vel potius absolutissima kyklopaideia (1538, 1541); Paul Skalich's Encyclopaediae sen orbis disciplinarum epistemon (1559); Gregor Reisch's Margarita philosophica (1503, retitled Encyclopaedia in 1583); and Samuel Eisenmenger's Cyclopaedia Paracelsica (1585). It is only with Pavao Skalić and his Encyclopediae seu orbis disciplinarum tam sacrarum quam profanarum epistemon (Encyclopaedia, or Knowledge of the World of Disciplines, Basel, 1559) that the term became first recognized as a noun. There have been two examples of the oldest vernacular use of the compounded word. In approximately 1490, Franciscus Puccius wrote a letter to Politianus thanking him for his Miscellanea, calling it an encyclopedia. More commonly, François Rabelais is cited for his use of the term in Pantagruel (1532). Several encyclopedias have names that include the suffix -p(a)edia, to mark the text as belonging to the genre of encyclopedias. For example, Banglapedia (on matters relevant for Bangladesh). Today in English, the word is most commonly spelled encyclopedia, though encyclopaedia (from encyclopædia) is also used in Britain. The modern encyclopedia was developed from the dictionary in the 18th century. Historically, both encyclopedias and dictionaries have been researched and written by well-educated, well-informed content experts, but they are significantly different in structure. A dictionary is a linguistic work which primarily focuses on alphabetical listing of words and their definitions. Synonymous words and those related by the subject matter are to be found scattered around the dictionary, giving no obvious place for in-depth treatment. Thus, a dictionary typically provides limited information, analysis or background for the word defined. While it may offer a definition, it may leave the reader lacking in understanding the meaning, significance or limitations of a term, and how the term relates to a broader field of knowledge. An encyclopedia is, theoretically, not written in order to convince, although one of its goals is indeed to convince its reader of its own veracity. To address those needs, an encyclopedia article is typically not limited to simple definitions, and is not limited to defining an individual word, but provides a more extensive meaning for a subject or discipline. In addition to defining and listing synonymous terms for the topic, the article is able to treat the topic's more extensive meaning in more depth and convey the most relevant accumulated knowledge on that subject. An encyclopedia article also often includes many maps and illustrations, as well as bibliography and statistics. Encyclopedias can be general, containing articles on topics in every field (the English-language Encyclopædia Britannica and German Brockhaus are well-known examples). General encyclopedias may contain guides on how to do a variety of things, as well as embedded dictionaries and gazetteers. There are also encyclopedias that cover a wide variety of topics from a particular cultural, ethnic, or national perspective, such as the Great Soviet Encyclopedia or Encyclopaedia Judaica. Works of encyclopedic scope aim to convey the important accumulated knowledge for their subject domain, such as an encyclopedia of medicine, philosophy, or law. Works vary in the breadth of material and the depth of discussion, depending on the target audience. Some systematic method of organization is essential to making an encyclopedia usable for reference. There have historically been two main methods of organizing printed encyclopedias: the alphabetical method (consisting of a number of separate articles, organized in alphabetical order) and organization by hierarchical categories. The former method is today the more common, especially for general works. The fluidity of electronic media, however, allows new possibilities for multiple methods of organization of the same content. Further, electronic media offer new capabilities for search, indexing and cross reference. The epigraph from Horace on the title page of the 18th century Encyclopédie suggests the importance of the structure of an encyclopedia: "What grace may be added to commonplace matters by the power of order and connection." As modern multimedia and the information age have evolved, new methods have emerged for the collection, verification, summation, and presentation of information of all kinds. Projects such as Everything2, Encarta, h2g2, and Wikipedia are examples of new forms of the encyclopedia as information retrieval becomes simpler. The method of production for an encyclopedia historically has been supported in both for-profit and non-profit contexts. The Great Soviet Encyclopedia mentioned above was entirely state sponsored, while the Britannica was supported as a for-profit institution. By comparison, Wikipedia is supported by volunteers contributing in a non-profit environment under the organization of the Wikimedia Foundation. Some works entitled "dictionaries" are actually similar to encyclopedias, especially those concerned with a particular field (such as the Dictionary of the Middle Ages, the Dictionary of American Naval Fighting Ships, and Black's Law Dictionary). The Macquarie Dictionary, Australia's national dictionary, became an encyclopedic dictionary after its first edition in recognition of the use of proper nouns in common communication, and the words derived from such proper nouns. There are some broad differences between encyclopedias and dictionaries. Most noticeably, encyclopedia articles are longer, fuller and more thorough than entries in most general-purpose dictionaries. There are differences in content as well. Generally speaking, dictionaries provide linguistic information about words themselves, while encyclopedias focus more on the thing for which those words stand. Thus, while dictionary entries are inextricably fixed to the word described, encyclopedia articles can be given a different entry name. As such, dictionary entries are not fully translatable into other languages, but encyclopedia articles can be. In practice, however, the distinction is not concrete, as there is no clear-cut difference between factual, "encyclopedic" information and linguistic information such as appears in dictionaries. Thus encyclopedias may contain material that is also found in dictionaries, and vice versa. In particular, dictionary entries often contain factual information about the thing named by the word. Encyclopedias have progressed from written form in antiquity, to print in modern times. Today they can also be distributed and displayed electronically. One of the earliest encyclopedic works to have survived to modern times is the Naturalis Historia of Pliny the Elder, a Roman statesman living in the first century AD. He compiled a work of 37 chapters covering natural history, architecture, medicine, geography, geology, and other aspects of the world around him. He stated in the preface that he had compiled 20,000 facts from 2000 works by over 200 authors, and added many others from his own experience. The work was published around AD 77–79, although Pliny probably never finished editing the work before his death in the eruption of Vesuvius in AD 79. Isidore of Seville, one of the greatest scholars of the early Middle Ages, is widely recognized for writing the first encyclopedia of the Middle Ages, the Etymologiae (The Etymologies) or Origines (around 630), in which he compiled a sizable portion of the learning available at his time, both ancient and contemporary. The work has 448 chapters in 20 volumes, and is valuable because of the quotes and fragments of texts by other authors that would have been lost had he not collected them. The most popular encyclopedia of the Carolingian Age was the De universo or De rerum naturis by Rabanus Maurus, written about 830; it was based on Etymologiae. The encyclopedia of Suda, a massive 10th-century Byzantine encyclopedia, had 30 000 entries, many drawing from ancient sources that have since been lost, and often derived from medieval Christian compilers. The text was arranged alphabetically with some slight deviations from common vowel order and place in the Greek alphabet. The early Muslim compilations of knowledge in the Middle Ages included many comprehensive works. Around year 960, the Brethren of Purity of Basra were engaged in their Encyclopedia of the Brethren of Purity. Notable works include Abu Bakr al-Razi's encyclopedia of science, the Mutazilite Al-Kindi's prolific output of 270 books, and Ibn Sina's medical encyclopedia, which was a standard reference work for centuries. Also notable are works of universal history (or sociology) from Asharites, al-Tabri, al-Masudi, Tabari's History of the Prophets and Kings, Ibn Rustah, al-Athir, and Ibn Khaldun, whose Muqadimmah contains cautions regarding trust in written records that remain wholly applicable today. The enormous encyclopedic work in China of the Four Great Books of Song, compiled by the 11th century AD during the early Song dynasty (960–1279), was a massive literary undertaking for the time. The last encyclopedia of the four, the Prime Tortoise of the Record Bureau, amounted to 9.4 million Chinese characters in 1000 written volumes. The 'period of the encyclopedists' spanned from the tenth to seventeenth centuries, during which the government of China employed hundreds of scholars to assemble massive encyclopedias. The largest of which is the Yongle Encyclopedia; it was completed in 1408 and consisted of almost 23,000 folio volumes in manuscript form. In late medieval Europe, several authors had the ambition of compiling the sum of human knowledge in a certain field or overall, for example Bartholomew of England, Vincent of Beauvais, Radulfus Ardens, Sydrac, Brunetto Latini, Giovanni da Sangiminiano, Pierre Bersuire. Some were women, like Hildegard of Bingen and Herrad of Landsberg. The most successful of those publications were the Speculum maius (Great Mirror) of Vincent of Beauvais and the De proprietatibus rerum (On the Properties of Things) by Bartholomew of England. The latter was translated (or adapted) into French, Provençal, Italian, English, Flemish, Anglo-Norman, Spanish, and German during the Middle Ages. Both were written in the middle of the 13th century. No medieval encyclopedia bore the title Encyclopaedia – they were often called On nature (De natura, De naturis rerum), Mirror (Speculum maius, Speculum universale), Treasure (Trésor). Medieval encyclopedias were all hand-copied and thus available mostly to wealthy patrons or monastic men of learning; they were expensive, and usually written for those extending knowledge rather than those using it. During the Renaissance, the creation of printing allowed a wider diffusion of encyclopedias and every scholar could have his or her own copy. The De expetendis et fugiendis rebus by Giorgio Valla was posthumously printed in 1501 by Aldo Manuzio in Venice. This work followed the traditional scheme of liberal arts. However, Valla added the translation of ancient Greek works on mathematics (firstly by Archimedes), newly discovered and translated. The Margarita Philosophica by Gregor Reisch, printed in 1503, was a complete encyclopedia explaining the seven liberal arts. The term encyclopaedia was coined by 16th-century humanists who misread copies of their texts of Pliny and Quintilian, and combined the two Greek words "enkyklios paideia" into one word, έγκυκλοπαιδεία. The phrase enkyklios paideia (ἐγκύκλιος παιδεία) was used by Plutarch and the Latin word Encyclopedia came from him. 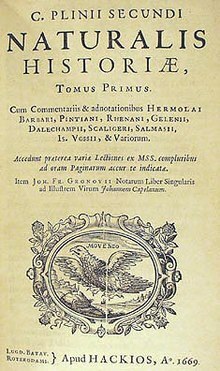 The first work titled in this way was the Encyclopedia orbisque doctrinarum, hoc est omnium artium, scientiarum, ipsius philosophiae index ac divisio written by Johannes Aventinus in 1517. The English physician and philosopher, Sir Thomas Browne used the word 'encyclopaedia' in 1646 in the preface to the reader to define his Pseudodoxia Epidemica, a major work of the 17th-century scientific revolution. Browne structured his encyclopaedia upon the time-honoured scheme of the Renaissance, the so-called 'scale of creation' which ascends through the mineral, vegetable, animal, human, planetary, and cosmological worlds. 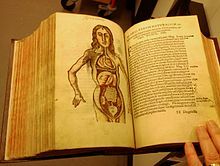 Pseudodoxia Epidemica was a European best-seller, translated into French, Dutch, and German as well as Latin it went through no fewer than five editions, each revised and augmented, the last edition appearing in 1672. Financial, commercial, legal, and intellectual factors changed the size of encyclopedias. During the Renaissance, middle classes had more time to read and encyclopedias helped them to learn more. Publishers wanted to increase their output so some countries like Germany started selling books missing alphabetical sections, to publish faster. Also, publishers could not afford all the resources by themselves, so multiple publishers would come together with their resources to create better encyclopedias. When publishing at the same rate became financially impossible, they turned to subscriptions and serial publications. This was risky for publishers because they had to find people that would pay all upfront or make payments. When this worked, capital would rise and there would be a steady income for encyclopedias. Later, rivalry grew, causing copyright to occur due to weak underdeveloped laws. Some publishers would copy another publisher's work to produce an encyclopedia faster and cheaper so consumers did not have to pay a lot and they would sell more. Encyclopedias made it to where middle-class citizens could basically have a small library in their own house. Europeans were becoming more curious about their society around them causing them to revolt against their government. The beginnings of the modern idea of the general-purpose, widely distributed printed encyclopedia precede the 18th century encyclopedists. However, Chambers' Cyclopaedia, or Universal Dictionary of Arts and Sciences (1728), and the Encyclopédie of Denis Diderot and Jean le Rond d'Alembert (1751 onwards), as well as Encyclopædia Britannica and the Conversations-Lexikon, were the first to realize the form we would recognize today, with a comprehensive scope of topics, discussed in depth and organized in an accessible, systematic method. 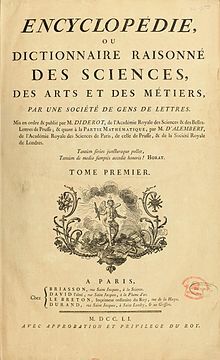 Chambers, in 1728, followed the earlier lead of John Harris's Lexicon Technicum of 1704 and later editions (see also below); this work was by its title and content "A Universal English Dictionary of Arts and Sciences: Explaining not only the Terms of Art, but the Arts Themselves". During the 19th and early 20th century, many smaller or less developed languages[which?] saw their first encyclopedias, using French, German, and English role models. While encyclopedias in larger languages, having large markets that could support a large editorial staff, churned out new 20-volume works in a few years and new editions with brief intervals, such publication plans often spanned a decade or more in smaller languages. Popular and affordable encyclopedias such as Harmsworth's Universal Encyclopaedia and the Children's Encyclopaedia appeared in the early 1920s. In the United States, the 1950s and 1960s saw the introduction of several large popular encyclopedias, often sold on installment plans. The best known of these were World Book and Funk and Wagnalls. The second half of the 20th century also saw the proliferation of specialized encyclopedias that compiled topics in specific fields. This trend has continued. Encyclopedias of at least one volume in size now exist for most if not all academic disciplines, including such narrow topics such as bioethics. By the late 20th century, encyclopedias were being published on CD-ROMs for use with personal computers. Microsoft's Encarta, published between 1993 and 2009, was a landmark example as it had no printed equivalent. Articles were supplemented with both video and audio files as well as numerous high-quality images. In 2001, Jimmy Wales and Larry Sanger launched Wikipedia, a multilingual, open-source, free online encyclopedia supported by the non-profit Wikimedia Foundation. Unlike commercial online encyclopedias such as Britannica Online, which are written by experts, Wikipedia is collaboratively edited by volunteers. As of 21 April 2019, there are 5,845,433 articles in the English Wikipedia. There are 287 different editions of Wikipedia. As of February 2014, it had 18 billion page views and nearly 500 million unique visitors each month. Wikipedia has more than 25 million accounts, out of which there were over 118,000 active editors globally, as of August 2015. A study by Nature in 2005 found that Wikipedia's science articles were roughly comparable in accuracy to those of Encyclopædia Britannica, containing the same number of serious errors and about 1/3 more minor factual inaccuracies, but Wikipedia's writing tended to be confusing and less readable. Encyclopædia Britannica denied the study's conclusions, deeming the study fatally flawed. Many academics, historians, teachers, and journalists reject Wikipedia as a reliable source of information, and Wikipedia is itself not a reliable source according to its own standards because of its openly editable wiki model. Critics argue Wikipedia exhibits systemic bias. Wikipedia is by far the largest web-based encyclopedia, but it is not the only one in existence. There are several much smaller, usually more specialized, encyclopedias on various themes, sometimes dedicated to a specific geographic region or time period. One example is the Stanford Encyclopedia of Philosophy. ^ "Encyclopedia". Archived from the original on August 3, 2007. Glossary of Library Terms. Riverside City College, Digital Library/Learning Resource Center. Retrieved on: November 17, 2007. ^ a b c Hartmann, R. R. K.; James, Gregory; James, Gregory (1998). Dictionary of Lexicography. Routledge. p. 48. ISBN 978-0-415-14143-7. Retrieved July 27, 2010. ^ a b "Encyclopaedia". Encyclopædia Britannica. Retrieved July 27, 2010. An English lexicographer, H.W. Fowler, wrote in the preface to the first edition (1911) of The Concise Oxford Dictionary of Current English language that a dictionary is concerned with the uses of words and phrases and with giving information about the things for which they stand only so far as current use of the words depends upon knowledge of those things. The emphasis in an encyclopedia is much more on the nature of the things for which the words and phrases stand. ^ a b c Hartmann, R. R. K.; Gregory, James (1998). Dictionary of Lexicography. Routledge. p. 49. ISBN 978-0-415-14143-7. Retrieved July 27, 2010. In contrast with linguistic information, encyclopedia material is more concerned with the description of objective realities than the words or phrases that refer to them. In practice, however, there is no hard and fast boundary between factual and lexical knowledge. ^ a b Cowie, Anthony Paul (2009). The Oxford History of English Lexicography, Volume I. Oxford University Press. p. 22. ISBN 978-0-415-14143-7. Retrieved August 17, 2010. An 'encyclopedia' (encyclopaedia) usually gives more information than a dictionary; it explains not only the words but also the things and concepts referred to by the words. ^ According to some accounts, such as the American Heritage Dictionary, copyists of Latin manuscripts took this phrase to be a single Greek word, ἐγκυκλοπαιδεία enkyklopaidia. ^ Franklin-Brown, Mary (2012). Reading the world : encyclopedic writing in the scholastic age. Chicago London: The University of Chicago Press. p. 8. ISBN 9780226260709. ^ König, Jason (2013). Encyclopaedism from antiquity to the Renaissance. New York: Cambridge University Press. p. 1. ISBN 978-1-107-03823-3. ^ Yeo, Richard (2001). Encyclopaedic visions : scientific dictionaries and enlightenment culture. Cambridge New York: Cambridge University Press. p. 6. ISBN 978-0521152921. ^ Harris-McCoy, Daniel (2008). Varieties of encyclopedism in the early Roman Empire: Vitruvius, Pliny the Elder, Artemidorus (Ph.D). University of Pennsylvania. p. 12. Retrieved January 18, 2018. ^ Harris-McCoy 2008, p. 11–12. ^ Roest, Bert (1997). "Compilation as Theme and Praxis in Franciscan Universal Chronicles". In Peter Binkley (ed.). Pre-Modern Encyclopaedic Texts: Proceedings of the Second Comers Congress, Groningen, 1 – July 4, 1996. BRILL. p. 213. ISBN 90-04-10830-0. ^ Carey, Sorcha (2003). "Two Strategies of Encyclopaedism". Pliny's Catalogue of Culture: Art and Empire in the Natural History. Oxford University Press. p. 17. ISBN 978-0-19-925913-7. ^ "encyclopaedia" (online). Oxford English Dictionary (OED.com), Oxford University Press. Retrieved February 18, 2012. ^ a b c Béjoint, Henri (2000). Modern Lexicography. Oxford University Press. p. 31. ISBN 978-0-19-829951-6. The two types, as we have seen, are not easily differentiated; encyclopedias contain information that is also to be found in dictionaries, and vice versa. ^ a b 1948-, Murray, Stuart (2009). The library : an illustrated history. New York, NY: Skyhorse Pub. ISBN 9781602397064. OCLC 277203534. ^ Monique Paulmier-Foucart, "Medieval Encyclopaedias", in André Vauchez (ed. ), Encyclopedia of the Middle Ages, James Clarke & Co, 2002. ^ See "Encyclopedia" in Dictionary of the Middle Ages. ^ έγκυκλοπαιδεία, Henry George Liddell, Robert Scott, A Greek–English Lexicon, at Perseus Project: "f. l. [= falsa lectio, Latin for "false reading"] for ἐγκύκλιος παιδεία"
^ Loveland, J. (2012). "Why Encyclopedias Got Bigger … and Smaller". Information & Culture. 47 (2): 233–254. doi:10.1353/lac.2012.0012. ^ Important Notice: MSN Encarta to be Discontinued. MSN Encarta. Archived from the original on October 31, 2009. ^ Cohen, Noam (February 9, 2014). "Wikipedia vs. the Small Screen". New York Times. ^ "Fatally Flawed: Refuting the recent study on encyclopedic accuracy by the journal Nature" (PDF). Encyclopædia Britannica, Inc. March 2006. Retrieved January 17, 2018. ^ Sidener, Jonathan (September 23, 2006). "Wikipedia co-founder looks to add accountability, end anarchy". The San Diego Union-Tribune. Retrieved January 16, 2017. ^ Reagle, Joseph; Rhue, Lauren (August 8, 2011). "Gender Bias in Wikipedia and Britannica". International Journal of Communication. 5: 21. ISSN 1932-8036. Retrieved November 1, 2018. ^ Holloway, Todd; Bozicevic, Miran; Börner, Katy (2007). "Analyzing and visualizing the semantic coverage of Wikipedia and its authors". Complexity. 12 (3): 30–40. arXiv:cs/0512085. Bibcode:2007Cmplx..12c..30H. doi:10.1002/cplx.20164. ^ Sideris A., "The Encyclopedic Concept in the Web Era", in Ioannides M., Arnold D., Niccolucci F. and K. Mania (eds. ), The e-volution of Information Communication Technology in Cultural Heritage. Where Hi-Tech Touches the Past: Risks and Challenges for the 21st Century. VAST 2006, Epoch, Budapest 2006, pp. 192-197. ISBN 963-8046-74-0. "Encyclopaedia". Encyclopædia Britannica. Retrieved July 27, 2010. Béjoint, Henri (2000). Modern Lexicography. Oxford University Press. ISBN 978-0-19-829951-6. C. Codoner, S. Louis, M. Paulmier-Foucart, D. Hüe, M. Salvat, A. Llinares, L'Encyclopédisme. Actes du Colloque de Caen, A. Becq (dir. ), Paris, 1991. Bergenholtz, H.; Nielsen, S.; Tarp, S., eds. (2009). Lexicography at a Crossroads: Dictionaries and Encyclopedias Today, Lexicographical Tools Tomorrow. Peter Lang. ISBN 978-3-03911-799-4. Blom, Phillip (2004). Enlightening the World: Encyclopédie, the Book that Changed the Course of History. New York; Basingstoke: Palgrave Macmillan. ISBN 978-1-4039-6895-1. OCLC 57669780. Collison, Robert Lewis (1966). Encyclopaedias: Their History Throughout the Ages (2nd ed.). New York, London: Hafner. OCLC 220101699. Cowie, Anthony Paul (2009). The Oxford History of English Lexicography, Volume I. Oxford University Press. ISBN 978-0-415-14143-7. Retrieved August 17, 2010. Darnton, Robert (1979). The business of enlightenment : a publishing history of the Encyclopédie, 1775–1800. Cambridge: Belknap Press. ISBN 978-0-674-08785-9. Hartmann, R. R. K.; James, Gregory; James, Gregory (1998). Dictionary of Lexicography. Routledge. ISBN 978-0-415-14143-7. Retrieved July 27, 2010. Kafker, Frank A., ed. (1981). Notable encyclopedias of the seventeenth and eighteenth centuries: nine predecessors of the Encyclopédie. Oxford: Voltaire Foundation. ISBN 978-0-7294-0256-9. OCLC 10645788. Kafker, Frank A., ed. (1994). Notable encyclopedias of the late eighteenth century: eleven successors of the Encyclopédie. Oxford: Voltaire Foundation. ISBN 978-0-7294-0467-9. OCLC 30787125. Needham, Joseph (1986). "Part 7, Military Technology; the Gunpowder Epic". Science and Civilization in China. 5 – Chemistry and Chemical Technology. Taipei: Caves Books Ltd. ISBN 978-0-521-30358-3. OCLC 59245877. Rosenzweig, Roy (June 2006). "Can History Be Open Source? Wikipedia and the Future of the Past". Journal of American History. 93 (1): 117–46. doi:10.2307/4486062. ISSN 1945-2314. JSTOR 4486062. Archived from the original on April 25, 2010. Sideris, Athanasios (2006). "The Encyclopedic Concept in the Web Era", in Ioannides M., Arnold D., Niccolucci F. and K. Mania (eds. ), The e-volution of Information Communication Technology in Cultural Heritage. Where Hi-Tech Touches the Past: Risks and Challenges for the 21st Century. VAST 2006, Epoch, Budapest, pp. 192–197. ISBN 963-8046-74-0. Walsh, S. Padraig (1968). Anglo-American general encyclopedias: a historical bibliography, 1703–1967. New York: Bowker. p. 270. OCLC 577541. Yeo, Richard R. (2001). Encyclopaedic visions : scientific dictionaries and enlightenment culture. Cambridge, New York: Cambridge University Press. ISBN 978-0-521-65191-2. OCLC 45828872. Look up encyclopedia, encyclopaedia, or encyclopedic in Wiktionary, the free dictionary. Wikimedia Commons has media related to Encyclopedias. Encyclopedia – Diderot's article on the Encyclopedia from the original Encyclopédie. Encyclopædia Britannica, articles and illustrations from 9th ed., 1875–89, and 10th ed., 1902–03. "Cyclopædia" . Collier's New Encyclopedia. 1921. "Encyclopædia" . Encyclopedia Americana. 1920. "Encyclopædia" . The New Student's Reference Work . 1914. "Encyclopaedia" . Encyclopædia Britannica (11th ed.). 1911. "Encyclopædia" . The Nuttall Encyclopædia. 1907. "Encyclopædia" . New International Encyclopedia. 1905. "Cyclopædia" . The American Cyclopædia. 1879.